AIT had previously defended its decision to invite Powell after the Jamaican was found guilty of doping in 2013. Powell said he had really been looking forward to running in front of the Irish fans. AFTER ALL THE build-up former 100m world record holder Asafa Powell didn’t end up racing at Athlone Institute of Technology Grand Prix tonight after suffering a groin injury in the warm-up. Powell – who served a six-month ban after testing positive for oxilofrane – pulled up before the race started and was forced to withdraw. “It was very unfortunate that I injured my groin in the warm-up and couldn’t race but these things happen in the sport,” Powell told Midlands103 sport. However, Powell also told the station that he plans on coming back to race at the event next year. The meet, which will also feature Mutaz Essa Barshim, the world indoor high jump champion and the fastest women alive in the shape of American sprinter Carmelita Jeter, takes place at AIT’s €10 million International Arena which opened in January 2013. However, while an attempt will also be made to record the first indoor sub-four minute mile by an Irish athlete on Irish soil, a lot of the focus in the build-up was on the Jamaican sprinter who tested positive for oxilofrane in July 2013 when he was handed an initial 18-month ban. Oxilofrane is an amphetamine class stimulant, banned by the World Anti-Doping Agency but found in some dietary supplements. Powell, whose personal best of 9.72 is the third fastest of all time, appealed to the Court of Arbitration for Sport and his ban was reduced to six months. In a statement issued to The42 today, a spokesperson for AIT said responsibility for extending invitations to participate in the grand prix rests solely with Athlone Institute of Technology, and it was in his capacity as president of the institute – and not president of Athletics Ireland – that Prof Ciarán Ó Catháin acted. “AIT in no way condones taking drugs in sport. “The AIT International Arena Grand Prix is organised to enable the Irish public experience world-class athletics in a state-of-the-art facility. In that context, an invitation was extended to the Jamaican sprinter, Asafa Powell, the third fastest man in history, to compete in Athlone in February 2015. However, while Powell is the obvious talking point, the very real possibility that Javier Sotomayor’s two decades old world record in the high jump could be broken tonight is also worthy of mention. While the event is a sell out, Irish TV on Sky 191 and irishtv.ie are showing the Athlone athletics meeting live from 7pm. Email “Asafa Powell pulls up in warm-up, forced to withdraw from Athlone race”. 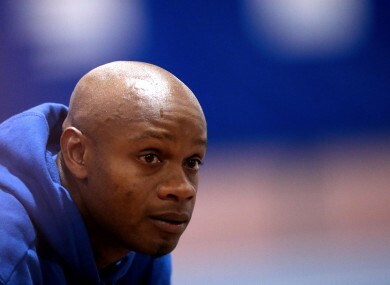 Feedback on “Asafa Powell pulls up in warm-up, forced to withdraw from Athlone race”.